Please say a prayer for, or drink a toast to, a group of brave, tenacious people who against all the odds are in Belfast High Court today for the beginning of their civil action against the Real IRA and men they believe were among the bombers of Omagh. And do the same for the supporters who helped them get there, including the thousands of Daily Mail readers who gave money to what so many said was a hopeless cause. I have been a part of this campaign since it began, as a journalist, an antiterrorist campaigner, an amateur fundraiser and a friend. As I write, like many others who have been closely involved, I am filled with a mixture of sadness, euphoria, exhaustion and apprehension. The sadness at the suffering of the bereaved and the injured is a constant; the euphoria is caused by joy that, after years and years of financial and legal setbacks, the families have actually got to court; the exhaustion has been cumulative over years of frustration, and in my case comes also from reliving it all in the book I have been writing about the case; and the apprehension is lest, after the 50 legal hearings it has taken to get to this point, there might yet be hidden legal landmines. Yet it is the euphoria that should be predominant today. Whatever happens, we must celebrate ordinary people who have stood up to terrorism, called the Real IRA to account in a court of law and done so against terrible odds. The bomb that went off in a country town on a sunny Saturday afternoon on the busiest shopping day of the year killed two babies (and two about to be born), three schoolgirls, four schoolboys, six students, four housewives, three shop assistants, a despatch clerk, a shopkeeper, a crane driver, a mechanic, a horticulturalist and a retired accounts clerk. It was the very ordinariness of the victims that struck the public imagination. It was their ordinariness, too, that must have made the bombers feel safe afterwards, as they set about destroying evidence and intimidating witnesses and doing their skilful utmost to frustrate police investigations. Yet they had bargained without Michael Gallagher, an Omagh motor mechanic, and Victor Barker, a Surrey solicitor, who had lost their adored sons, 21-year-old Aidan and 12-year- old James, respectively. It was Michael who turned an ad hoc group of victims into the Omagh Support and Self-Help Group, whose members learned to deal with authority and eventually became a powerful weapon in the search for justice. It was Victor, an inveterate critic of politicians and police he thought were slacking, who came up with the idea of a civil case. There was the primary difficulty of finding a lawyer - most were terrified of the Real IRA, who were bombing in London as well as Northern Ireland. There was no precedent for victims suing terrorists so there was no case law. We were told over and over again the case was a nonstarter. The families had no money, and legal aid was not available for a civil action. However, in September 2000, lawyer Jason McCue took the risk. He had made his reputation defeating the chief of staff of the IRA, Thomas 'Slab' Murphy, in a libel action Murphy had taken against a newspaper that accused him of being a smuggler and a member of the IRA. 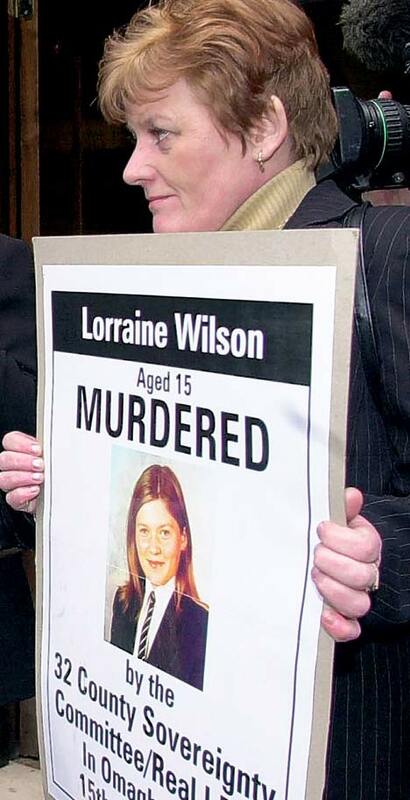 An ally provided some seed-corn money and, after meeting bereaved relatives, Paul Dacre, editor of the Daily Mail, decided to launch a campaign called Justice for the Omagh Innocents. Tens of thousands began to roll in. In the end, so ground-breaking was the case and so determined were the defendants' lawyers to block it with the use of every possible technicality, it would cost more than £2million. With the help of the Mail, our London fundraising group managed to gather £1.2 million over three years. Finding individual donors was difficult - innumerable otherwise sympathetic people turned us down because they were afraid the Real IRA would somehow find out and come after their children. But there were people of courage who stood up and were counted. Bob Geldof became a frontman for the campaign; racing driver Eddie Irvine and rock group U2 were among those who gave openly. And at the moment when we thought we were facing defeat, with no-one left to beg from, Peter Mandelson saved the campaign. To the surprise of many, from the day in October 2000 when, as Secretary of State for Northern Ireland, Mandelson met representatives of the Omagh support group, he was determined to help in whatever way he could. When he lost his job the following January he gave the Omagh campaign the substantial proceeds of a newspaper article he wrote about his downfall, spoke at fundraising events and finally, when all seemed lost, persuaded the government to provide legal aid. "All that is necessary for the triumph of evil is that good men do nothing," is the quote from the 18th century writer and philosopher Edmund Burke that has been an inspiration for the victims of Omagh. Every good man and woman who played a part in helping them challenge the Real IRA can feel proud today; every reader of the Mail who sent a contribution gave the victims hope and courage. And despite all the delays and the setbacks, they have already achieved a great deal. Even before it begins, the Omagh case has created a precedent for victims suing terrorists under civil law and other such cases are in motion. Ordinary people faced tragedy and found within themselves extraordinary resources of courage and determination. Today they deserve our respect, congratulations and good wishes. Ruth Dudley Edwards's book Aftermath: The Omagh bombings and the families' pursuit of justice, will be published by Harvill Secker this summer.